Please find the ATSD Board Policy on Harassment, Intimidation and Bullying (HIB) by clicking here. The Allamuchy Township School District aims to create an environment where all children feel safe, secure and ready to learn. Each year we integrate lessons on character education through Character Counts, bullying prevention and positive school climate through Olweus monthly meetings and other proactive learning opportunities. 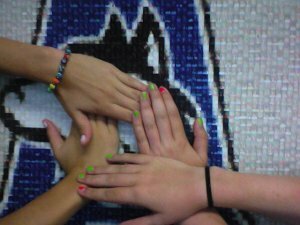 We also employ several proactive measures designed to catch students doing the right thing and acknowledge positive behavior through our Wolf Pack Pride initiative. The Board of Education prohibits acts of harassment, intimidation, or bullying of a student. A safe and civil environment in school is necessary for pupils to learn and achieve high academic standards. Harassment, intimidation, or bullying, like other disruptive or violent behaviors, is conduct that disrupts both a student’s ability to learn and a school’s ability to educate its students in a safe and disciplined environment. Since pupils learn by example, school administrators, faculty, staff and volunteers should be commended for demonstrating appropriate behavior, treating others with civility and respect, and refusing to tolerate harassment, intimidation, or bullying.